In a media release today Emirates announced they are upgrading the Dubai – Sydney – Christchurch route with their A380. A 777-300ER currently operates the route. Tuesday, September 6, 2016 — DUBAI, UAE – 6 September 2016 – Emirates A380s will fly between Dubai and New Zealand five times daily from 30 October with the introduction of the airline’s double-decker flagship aircraft on Christchurch services. Emirates will be the first airline to offer regularly scheduled A380 services to and from Christchurch with the upgrade of the current daily Christchurch service from Boeing 777-300ERs, along with the removal of the en-route stop in Bangkok which will enable passengers to travel all the way from Christchurch and Dubai, with just one stop in Sydney. The launch of the Christchurch A380 flights will coincide with the introduction of the A380 on Emirates’ daily non-stop route between Dubai and Auckland. Emirates currently also operates three other daily A380 services between Auckland and Dubai and beyond via Australia (Sydney, Melbourne or Brisbane). Outbound EK412 will depart Dubai at 10:15 hours, seamlessly connecting with southbound services from European destinations such as Amsterdam, Barcelona, London, Manchester and many more of Emirates’ 38 Europe services. EK412 will stop only in Sydney before arriving in Christchurch at 13:50 hours the next day (local time). The return flight EK413 will depart Christchurch at 18:45 hours, touching down in Dubai at 05:15 hours the next day after its stop in Sydney, reducing the journey time to Dubai and Europe by about two hours in each direction. At the same time, the Dubai service to Auckland via Sydney, will feature the opportunity for travellers to explore Southeast Asia or Australia en route as this service, EK418, will operate via the popular hub that is Bangkok, as well as Sydney. Flight EK418 will depart Dubai at 08:55 hours and arrive in Auckland at 15:55 hours the following day (local time). The return service, via Sydney and Bangkok, operating as flight EK419, will depart Auckland at 16:30 hours and arrive in Dubai the following morning at 06:45 hours. Known as the Garden City, Christchurch is the main gateway to the South Island and is set on the Canterbury Plains. The picturesque Avon River runs through the middle of the city of more than 380,000 residents. The banks of the river feature cycle paths, the green expanse of Hagley Park and the Christchurch Botanic Gardens. Other tourist attractions include the International Antarctic Centre, the Christchurch Art Gallery and the start point for scenic journeys on the Trans Alpine passenger train. Emirates is the only airline offering year-round scheduled A380 services to and from New Zealand. All daily A380 flights provide connections in Dubai with direct Emirates flights to and from 38 destinations in Europe, as well as a number of cities in Africa and the Middle East. On many of Emirates’ routes, Auckland and Christchurch passengers will be able to fly all the way in both directions on an A380, including on services connecting New Zealand with London (Heathrow and Gatwick), Manchester, Paris, Amsterdam, Rome, Milan, Frankfurt, Munich, Barcelona and Zurich. The introduction of the new service will also mean Sydney-based travellers will have a wider choice of routeings and timings on A380 flights, with the Christchurch A380 in addition to two current daily Emirates A380 services plus partner Qantas’ A380 service to Dubai. All New Zealand services will continue to offer three classes of travel – First, Business and Economy, with generous free baggage allowance (up to 35kg in Economy, 40kg in Business and 50kg in First Class). 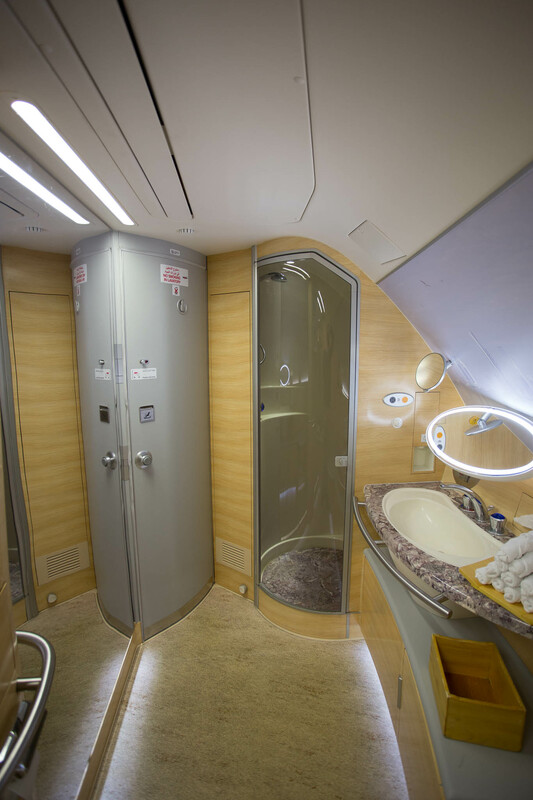 On Emirates‘ A380s, First Class passengers can look forward to quiet luxury in the comfort of their private suites and enjoy the industry’s only Onboard Shower Spa. First Class and Business Class passengers can socialise and sample canapes and cocktails at the popular Onboard Lounge and passengers in all classes can enjoy the gourmet cuisine, Emirates‘ award-winning inflight entertainment, ice, with more than 2,500 channels and free Wi-Fi, which is available on all of Emirates’ A380s. 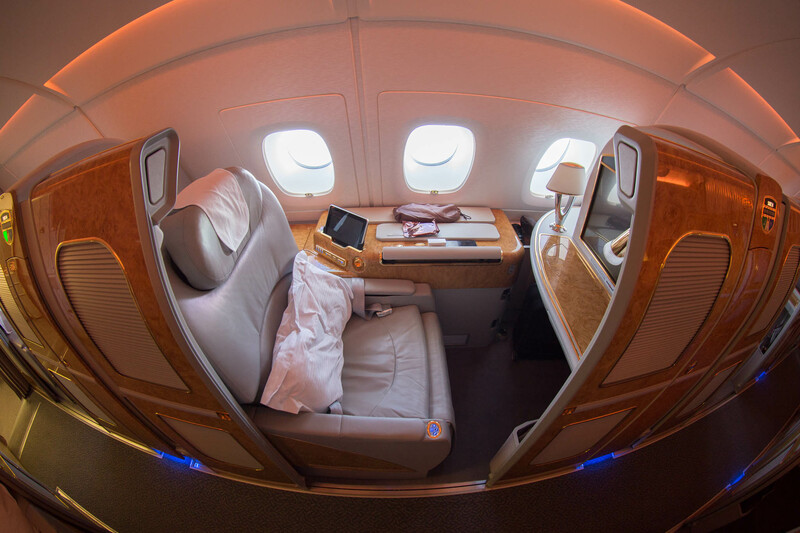 The A380 have a few enhancements over the 777 such as full flat seats for business class, onboard bar, and larger bathrooms with a shower for first class.